Eman Khalifa, Mohammad A. Nossair, Mousa A. Ayoub, Ghada A. Hadad. 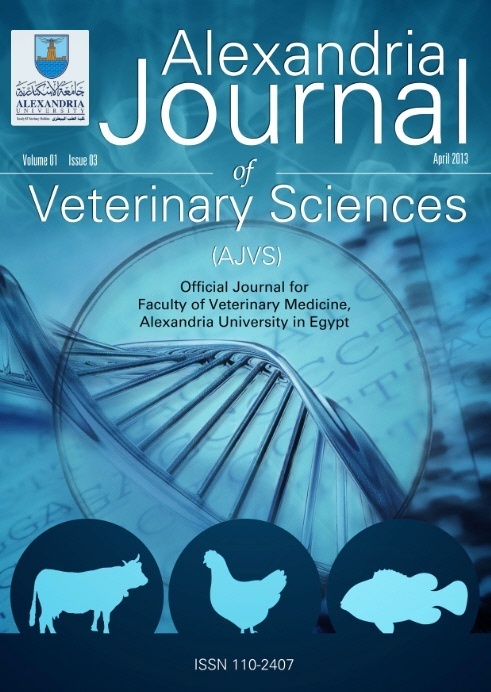 The current study was conducted to study the molecular characterization of diarrheagenic Escherichia coli in neonatal calves and human. A total of 100 faecal samples were collected from diarrheic calves up to 3-months old. Also, 100 stool specimens were gathered from diarrheic humans during the period between April and July, 2016. Samples were screened for isolation of E. coli using standard laboratory procedures. 17 isolates of E. coli were recovered from calves (9) and human (8). Serological identification of E. coli recovered from calves revealed the presence of O26 (2), O118 (1), O111 (2), O157:H7 (3) and O103 (1) while that of E. coli isolates recovered from humans clarified the presence of O91:H21 (2), O121:H7 (1), O114:H2 (3) and O44:H18 (2). The antimicrobial resistance of the identified serogroups clarified that E. coli O26 serotype was sensitive to Enrofloxacin, Spectinomycin and Neomycin, E. coli O118 serotype was sensitive to Tetracycline, Spectinomycin and Neomycin, E. coli O111 serotype was moderately susceptible to Enrofloxacin, Amoxicillin, Spectinomycin and Neomycin, E. coli O 157 serotype was sensitive to Amoxicillin while moderately susceptible to Cefotaxime and Tetracycline and finally E. coli O 103 serotype was sensitive to Enrofloxacin only. On the other side, results of antimicrobial resistance of Enteropathogenic E. coli serogroups recovered from diarrheic humans revealed that E. coli O91:H21 was sensitive to Amoxicillin and Erythromycin and moderately sensitive to Ciprofloxacin, Enrofloxacin and Oxytetracycline while it was resistant to Flumequine and Doxycycline. Also, E. coli O121:H7 was sensitive to Ciprofloxacin and Amoxicillin while it was resistant to Flumequine, Enrofloxacin and Doxycycline. In addition, E. coli O114:H2 was resistant to Amoxicillin only. Lastly, E. coli O44:H18 was found to sensitive and moderately sensitive to the used antibiotic. Finally, molecular characterization of the obtained isolated using multiplex PCR for stx1, stx2 and eaeA genes for characterization of E. coli was performed. The obtained results indicated that the application of multiplex PCR assay was important to develop a highly sensitive and specific diagnostic method for rapid detection of E. coli in diarrheic calves and humans.